Well said. Everyone needs a cutlist, but few enjoy manually pulling off the parts and their dimensions to create one. The benefit of the list, as Phillip says, is the list helps us purchase AND avoid mistakes. Ever cut a shelf board too short? A cutlist can help avoid mistakes. And it can help you purchase the correct amounts. And, to take this a step further, it can aid your production in the shop. First step. The basic list. In SketchList 3D the contents of the cut list are defined by the Parts List Report form. Find this under the Reports menu item. The results are helpful, if not a bit boring. BUT much better than pulling off your cut list by hand for sure. Anyhow. What else can the cutlist do? Sort by any item shown on the cutlist. Sorts can be, of course, ascending or descending. This means you can sort your list by part name, material types, thicknesses, which boards have joinery…. Any type of report you may need in planning and executing the product of the job in your shop. Filter by the value of and item shown on the report. 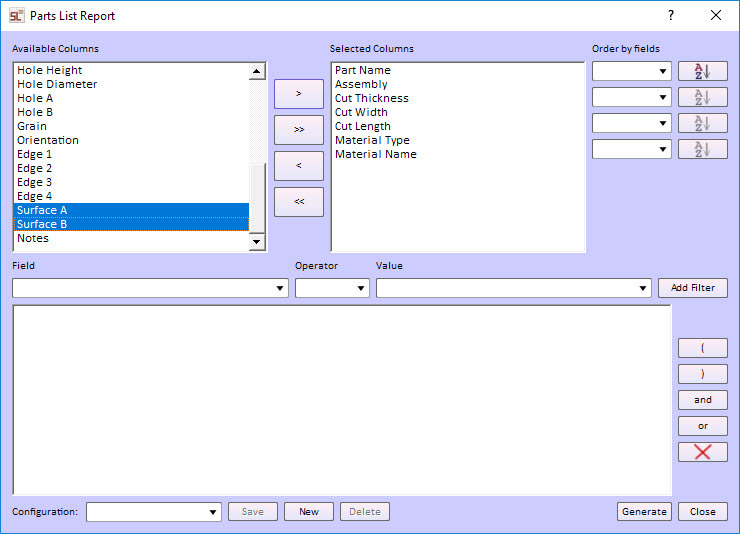 This allows you to create a list that shows – for example, only parts with bullnose contour. Combinations of information that meet your needs in the shop can be developed once and saved for future use. This link is to an older post about lists and layout diagram. You see you really need a sheet goods optimized to truly know how much material to buy. Saving a $75 sheet of plywood on every job helps the bottom line.